Dent Halikarnas Dental Clinic practice provides comprehensive and beautiful esthetic dentistry. Restorative dentistry seeks to repair or replace your natural teeth in order to return your mouth to full functional and aesthetic harmony. The restorative work can range from simple fillings and crowns to more complex root canal therapy and tooth replacement implants. No matter what stage of restorative care your teeth require, we can offer solutions.Gone are the days when tooth trauma and cavities could only be treated with unsightly metal fillings. Today, modern, tooth-colored fillings made of durable resin can be bonded to your teeth for a stronger, more natural-looking effect. 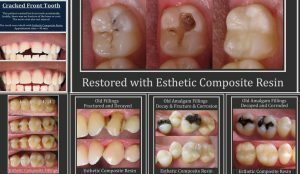 Composite fillings are virtually undetectable and require only a single appointment to apply.